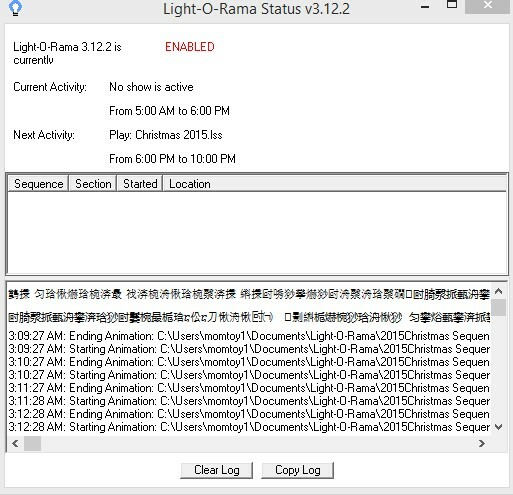 Status Log showing Chinese text ? I have Chinese text showing up at the top of my Status Log. I clear the nights activity and it goes away but is there again the next morning when I look. What? Why? Is it a problem I should worry about? I see it also, although not every day after clearing the log. This year running 3.12.2, but saw it last year also and I believe that was 3.9.? Same here, once in a while it happens. this means "you've been hacked"
I dont think there has been any hacking going on with the problem. A fix has been posted in the "Important Announcements" forum. Hopefully it will solve your guys problem. Thanks for the info "stil"
First time I've gotten the "Chinese" text. I've been running the show since Thanksgiving with no problems. Tonight for the first time I decide to run the Visualizer along with the show. I'm pretty sure that's what locked it up along with that text. Rebooted and reset with no Visualizer running..... all is good again. I have the visualizer running on my PC. I always get chinese text but never had any problems with the show. There were many bugs fixed in the latest release of the software which this issue was included in. Did Bob ever explain what the problem was?